Nobody likes to talk about it, but it’s an undeniable fact: bathrooms are a hard place to organized. Countertops seem to get cluttered and stay cluttered, vanities are hard to keep straight, and when you just want to take a shower it’s the last thing you want to deal with. 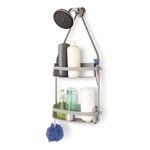 Shelving.com has the answer - our countertop organizers, cabinets, and vanities can fit both your bathroom decor and your budget, and our solutions can fit any size bathroom. And with our entryway storage you know your mornings will get that much easier. Start - or end - your day on the right foot with Shelving.com. Vanities are a great addition to bathrooms, bedrooms, large closets or dressing rooms because they free up scarce bathroom counter space while still keeping the items you need to get ready every day within reach. Having a designated space for your own makeup and accessories will make your morning more peaceful so you can have a better day, so go ahead and treat yourself. Cords from hair styling tools can be a pain to deal with in a bathroom, and special care must be taken when keeping around the bathroom counter near the sink. Our Hair Styling Stations eliminate most of the plug mess and worry by hiding individual cords in the back of the station with a power cord, so there’s only one cord for three tools to ever worry about plugging in. Do you have extra space in your bathroom but not enough storage? Then your bathroom is the perfect candidate for a stylish accent cabinet to improve the look and usability of your space. You can turn the cabinet into a hair styling station store hand towels right where you need them instead of a closet down the hall, or just keep some lesser used items handy but out of the way.